Wyatt Cenac, Tracey Heggins, Elizabeth Acker et al. 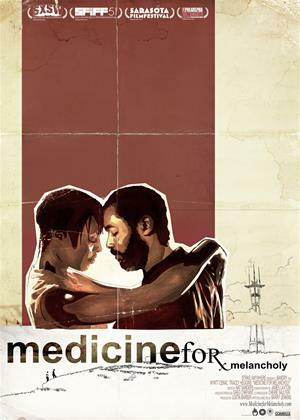 "Medicine for Melancholy" chronicles the one-day romance of Micah (Wyatt Cenac) and Jo (Tracey Heggins), two black twenty-somethings who have a one night stand and end up spending a full day and night together despite Jo's long-distance relationship with a wealthy white gallery owner. The characters wake up in someone else's bed after a party and head their separate ways. Jo leaves her wallet in their shared taxi and they reconnect when he returns it to her at her apartment. Throughout the day, Micah and Jo visit the Museum of the African Diaspora, stumble upon an affordable housing coalition meeting and attend a concert. Venturing around San Francisco, the characters discuss race and gentrification with regard to the low percentage of blacks living in San Francisco. Micah is openly critical of Jo's interracial relationship as he struggles to reconcile his black identity with the predominantly white world of the hipster scene in San Francisco.